With a barely-there 2mm diameter, this stainless steel wire rope is actually not even the thinnest example of our 1×19 configuration range. The 2mm 1×19 stainless steel wire rope can be an attractive addition to a design project, a practical part of marine rigging or anything in between. Unlike steel in its basic form, this stainless steel rope will be able to rebuke the advances of corrosion for longer. Rain, sleet, snow or rough seas will not leave it smattered with rust, while the shiny surface can be cleaned and maintained with minimal fuss. 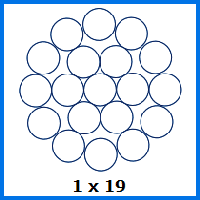 Its 2mm diameter and 1×19 arrangement of wire strands delivers a load limit of 336kg and a breaking force of 3.3kN. While not especially well suited to lifting applications, this rope still stacks up thanks to its good looks, light weight and versatility. Finding fittings on our site is easy, so you can pick the perfect terminals to go with your stainless steel wire rope order. Why bother struggling to attach these yourself, when you can rely on our in-house team to sort this out for you? This is the icing on the cake when it comes to ordering wire rope products from us. If you want to email us your questions, or request a quote, you can do so via our website contact form. Alternatively our phone number is 01384 78004 and a member of our specialist sales team will be able to help out, so long as you call during our opening hours. 2mm 1x19 Stainless Steel Wire Rope Overall rating: 5 out of 5 based on 6 reviews.